Synopsis: Look, I didn't want to be a half-blood. I never asked to be the son of a Greek God. I was just a normal kid, going to school, playing basketball, skateboarding. The usual. Until I accidentally vaporized my maths teacher. That's when things started really going wrong. Now I spend my time fighting with swords, battling monsters with my friends, and generally trying to stay alive. This is the one where Zeus, God of the Sky, thinks I've stolen his lightning bolt - and making Zeus angry is a very bad idea. Can Percy find the lightning bolt before a fully-fledged war of the Gods erupts? I’ve been wanting to read Percy Jackson and the Lightning Thief for some time now, but I always had ‘better’ things to read. Now, after I’d seen the film adaptation, I was deeply enthralled. Although the the film in itself wasn’t great, it had teased me enough to want to read the full novel. It’s an interesting concept; making the Greek gods alive and kicking in the modern day. And it’s one that Rick Riordan has pulled of nicely. The idea if the gods coming down from Olympus and having kids with immortals is fascinating, and I love the way he did it: that the strengths and weaknesses of the demigod follow suit to that of the parent god, how they have inherited powers etc. It gives a nice touch and interesting relationship between the demigods…. One of the most obvious common ideas in Percy Jackson and the Lightning Thief are the main characters. Yes- two boys and a girl, all about the same age, with Percy Jackson being the one who it all spins around. I can’t say that these characters were great; I felt that they sometimes lacked some emotion (this is most evident in the fact that Percy doesn’t show much sadness at the loss of his mother) and Percy’s anger came across as a bit half hearted sometimes. They’re no great characters, but they work with the story, and I think that’s what counts, and it’s still entertaining to read about them. I did enjoy how Percy Jackson was written, though. The first person perspective is quite neat, and I thought it worked quite well for the story. In that respect, I found the first page or so quite similar to Maximum Ride by James Patterson, although the similarities end there. You wouldn’t really think that Percy Jackson and the Lightning Thief has many comedic moments, but it has quite a few, which I was surprised about. I found them quite entertaining and I particularly liked the dry humour in the chapter titles, which were always slightly mysterious and odd. Of course, I might just have a rotten sense of humour, and you might not find it funny at all, but you won’t find out until you’ve read the book! 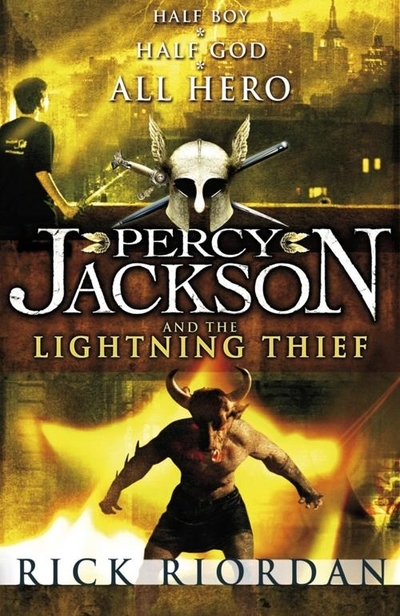 Percy Jackson and the Lightning Thief has a nice fast pace and the Greek mythology embedded into the story is entertaining yet informative, although not preachy, which was good. For older readers, Percy Jackson is probably more of a light read, although I still think you’ll enjoy it, as it does have a nice concept. For younger readers, you’ll enjoy every bit of it, and you’ll love the action and adventure. All in all, I really loved this read…it’s entertaining, unputdownable and a great read for all ages. If you’re a fan of Harry Potter, you’ll love this.